Go to www.guidestar.org and sign in using your registered email address and password. Click the Search link in the toolbar located on the top left-hand side of your screen. This will take you to the GuideStar Search page. Search for a nonprofit by typing an organization name, Employer Identification Number (EIN), or keyword into the search bar. Click on the organization's name to view its GuideStar Nonprofit Profile. 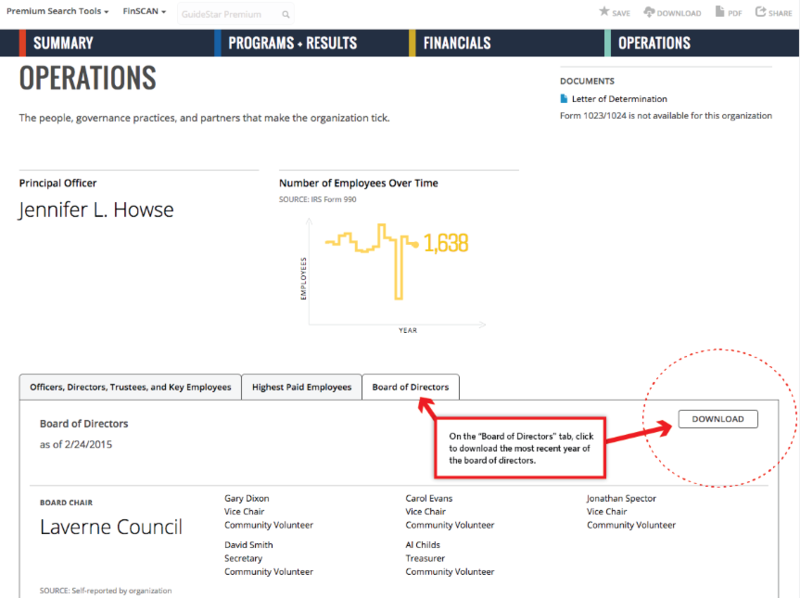 On a Nonprofit Profile, scroll down to the Operations section. Click on the tab titled Board of Directors. Click the Download button, which is located on the right-hand side of the screen. How does the County filter work?